Four stories entwined with a spiral, yet each following their own journey of discovery. 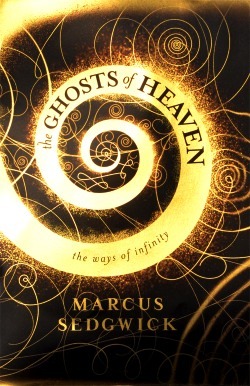 Marcus Sedgwick has taken a different turn with The Ghosts of Heaven. From the dawn of awakening at the beginning of mankind to the very end of time and distance in space – his characters seeking meaning and court madness in difficult circumstances. This is not your usual YA fare, surely aimed right across the spectrum of readers in general and written with the unmistakeable style and flair that is his trademark. ‘Whispers in the dark’ tells of a girl who believes she has the skills to be the guardian of magic for her tribe and she is on the very edge of awakening consciousness, driven by the designs on a snail to the mysterious cave paintings that are so essential to the hunt. This is poignant and vivid telling of what it must be like to live in a primitive era, yet bound by unspoken rules and traditions - the text is styled like an epic poem that entrances as the tale unfolds. ‘The Witch in the Water’ leaps forward to a time when suspicions and fear ruled the land and priests and others sought to make a name for themselves by exposing evil. Based on a very real event – a beautiful girl has taken up the calling of their just passed mother. Anna – the heroine is a girl of good character- who steps up to the plate to care for her afflicted brother and works hard by day and helps people with home made remedies at night. Into this simple village life strides Father Escrove, a man who sees evil everywhere and seeks to poison the well of happiness with all his scheming. The spiral is here too, not just in the water, but as life is spun out of control by one man’s malevolence. Anna – the good girl – is about to discover just how much God hates her and all that live in her village. ‘The Easiest Room in Hell’ is perhaps the most complete and satisfying of the quartet and the spiral at the heart of the tale is a twisting staircase in a lunatic asylum in early 20th Century America. Dr James is newly arrived at the asylum with his daughter, Verity. He is widowed and has taken the job on the condition that he could bring his daughter along to attend the local school. Dr Philips runs the institution on ‘modern’ methods. Each floor a different level of ‘madness’ and on the bottom floor among the most severe cases lies Charles Dexter, lucid, apparently far from insane, an immediate challenge for Dr James. The story heaves with conflicted emotion and builds up a relentless tension as Dr James becomes fascinated with Dexter and vice versa. On the way Dr Philips is revealed to be not quite the benign man one is led to believe and Verity is bullied by the local kids. The resolution when it comes catches one by surprise. And finally we are deep space – on a hundred year flight where the Sentinel’s, the ten technician guardians are scheduled to wake every ten years for just 12 hours to check and maintain the space ship The Song of Destiny as it makes it’s historic journey through space to another earth. There are 500 passengers on board, deep-frozen, maintained in a controlled coma. When Bowman, the Sentinel awakes for his shift he discovers that six of the five hundred are dead. When inspecting the first body he thinks he glimpses someone out of the corner of his eye and in turning accidentally knocks himself out. He awakes just in time to get back safely to his pod and sleep for ten more years – but who is loose on the ship and why are they killing the passengers? In the truest sense – here then is a death spiral to solve in slow motion. How does this connect to the other three tales? Perhaps it’s a fascination with the endlessness of life – infinity and beyond, as it were.